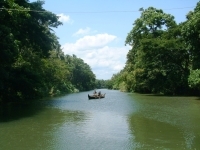 One of the most memorable experiences for many travellers in Kerala is a boat journey on the state's famous backwaters. The best-known of these areas is Kuttanad, situated between the hills in the west and the Arabian Sea, and stretching for 50 miles south of Kochi (formerly Cochin). This extraordinary maze of rivers, lakes, canals and estuaries is lined with dense tropical greenery and reveals a Keralan lifestyle that is totally hidden from the road. Boats are the only way to explore this area, billed as Kaleidoscope Kerala, where views change around every bend: narrow tree-covered canals open onto dazzling vistas of paddy fields, and through the trees can be glimpsed churches, mosques, temples, and small farms and villages which remain relatively untouched by the modern world. Buffaloes are used for ploughing the fields and women bathe and wash their clothes in the rivers. Roads do cross this area, but are almost entirely linked by manually-operated ferries rather than bridges. Kingfishers, cormorants and fish eagles compete with fisherman in rowing boats for the dwindling fish population. Providing visitors with the chance to just sit back and allow life to unfold around them at its own, slow pace, a trip on the Keralan backwaters is the ideal tonic for travel fatigue - especially if the experience of cities like Mumbai, Delhi and Kolkata has tourists feeling a bit strung out.